Tomorrow is St Patrick's Day, and like the past 100 years, there will be celebrations at Carlton's Dan O'Connell Hotel, which is known for its Celtic and folk music. Thousands of people come each year to party in the park next to the pub, and the event has the support of police, residents and the Melbourne City Council. However this year's may be the last, because Liquor Licensing Director Sue MacLellan will only give the event a 10pm liquor licence rather than the usual 1am licence, which makes it financially unviable. Worse, without income from this annual event the hotel business will not be as healthy as it was, apparently… see the Dan’s pages for more on this. The Hotel’s manager Toby Kingsley says "Crowd behaviour has been exemplary in the past" and that "the director of liquor licensing has insisted on maintaining a draconian approach to live music venues while many violent inner-city nightclubs continue to trade unabated". 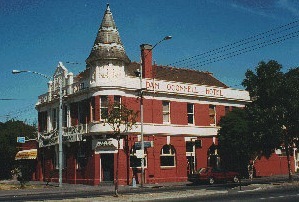 Read about this in Last St Patrick's at Dan O'Connell (The Age 4/3) and on the Dan's website: The last ever St Pat’s Day? You may wish to join Facebook group Save St Patrick's Day at the Dan O'Connell. And come along to St Pat's at the Dan! But be early… it finishes at 10 o'clock.